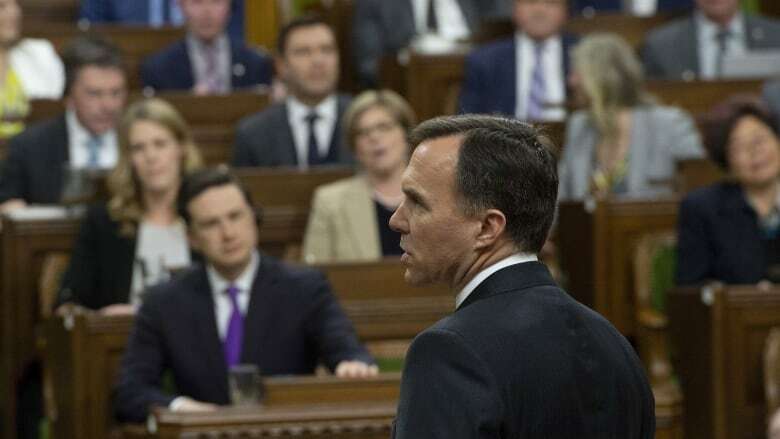 Federal Finance Minister Bill Morneau has tabled his government's 2019 budget, getting around a threat by the Opposition Conservatives to stir up a disruption because Liberal MPs on the justice committee had shut down an investigation into the SNC-Lavalin affair. Morneau tabled his government's 2019 budget just before 4 p.m., getting around a threat by the Opposition Conservatives to stir up a disruption because Liberal MPs on the justice committee had shut down an investigation into the SNC-Lavalin affair. But his budget speech was delayed by procedural votes. 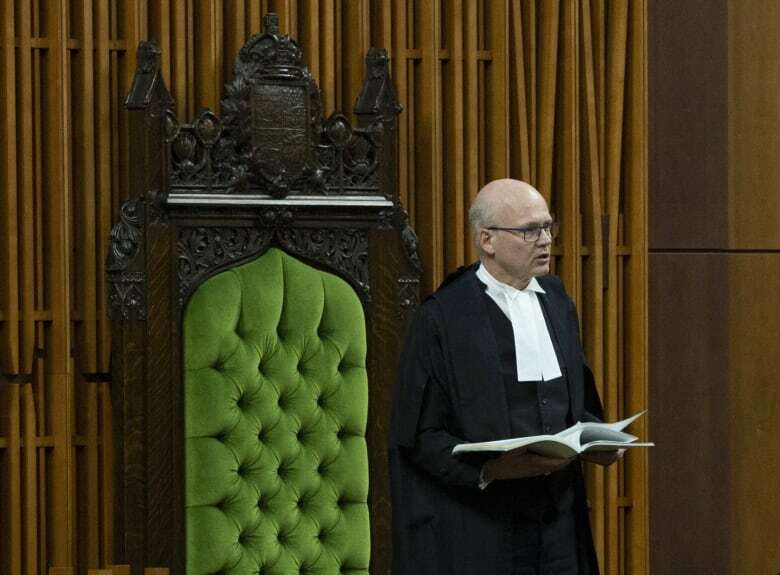 When he did stand to speak, he was drowned out by Opposition MPs banging on their desks and chanting "let her speak" — a reference to Jody Wilson-Raybould, whose resignation from cabinet last month over the SNC-Lavalin controversy has left the government on the defensive for weeks. The Conservatives had threatened all day to disrupt the vote in hopes of delaying Morneau's speech to make a point about the justice committee. The Tories went ahead with their delaying tactics, which included having a number of Tory MPs voting both for and against the motion. MPs also rose on points of privilege and points of order, further delaying Morneau's speech. Conservative MPs eventually walked out of the Commons, with Conservative Leader Andrew Scheer calling the justice committee's decision "an assault on democracy." The justice committee was looking into allegations the Prime Minister's Office and other officials inappropriately pressured Jody Wilson-Raybould, justice minister and attorney general at the time, to allow Quebec engineering firm SNC-Lavalin to avoid criminal prosecution on bribery charges providing it met certain conditions in a remediation agreement. After about two hours, members of the Conservative Party and the NDP emerged and said the Liberals — who hold the majority on the committee — voted in favour of a motion to "consider the meetings on this topic to be concluded." Scheer told reporters that the Tories "will consider emergency actions in Parliament to stop this coverup and highlight what (Prime Minister) Justin Trudeau has done." "This is an abuse of power. It's an affront to democracy and an attack on Parliament," Scheer told reporters Tuesday after the committee finished meeting behind closed doors. "This is corruption on top of corruption on top of corruption." Trudeau said the Conservatives are desperate to discuss anything except the budget and the state of the economy. "I think it's quite interesting that the Conservatives desperately don't want to talk about the economy. I think a lot of people will raise an eyebrow at that," he told reporters before heading into question period, where the SNC-Lavalin scandal once again dominated. "They have no plan. They've never had a plan to grow the economy." The NDP said it would not partake in the Conservatives' plan to put off the budget speech, but renewed calls for a public inquiry. "This is outrageous. They just want to keep Canadians in the dark. We need to launch a public inquiry now," said NDP MP Murray Rankin, the party's justice critic. "If there was ever evidence needed that Liberal MPs on the justice committee are agents of the prime minister, doing the work of the prime minister to cover up the prime minister's misdeeds, then one need only look at what happened at this meeting today, where the Liberals have shut down the process," said Conservative MP Michael Cooper, a vice-chair of the committee. Liberal MP Randy Boissonnault told reporters Tuesday it's time for the committee to move on. "We have heard from many of the key players in this matter," he said. "It's time now for the justice committee to do its work." The five Liberal members signalled their intentions Monday night when they wrote to committee chair Anthony Housefather saying their work is done, and that any further examination of the SNC-Lavalin affair should be left to the conflict of interest and ethics commissioner. The day started on a sour note. 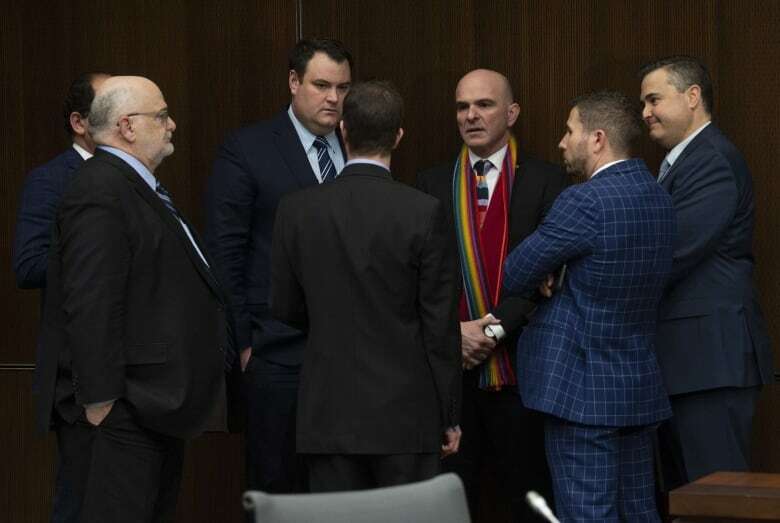 Soon after the committee meeting started Tuesday, Opposition MPs left the committee rooms, accusing the Liberals of making a mockery of the in-camera proceedings after a document detailing a motion related to hate crimes was handed to reporters and subsequently tweeted out. Conservative MP Lisa Raitt said it called into question what is actually in camera and what is not. "This is yet another effort to change the channel," added Rankin. In the letter signed by Boissonnault, Iqra Khalid, Ali Ehsassi, Ron McKinnon and Colin Fraser, the Liberal MPs on the committee write that they set out to probe the allegations with an "open mind," but accuse the opposition MPs of falling short. "[Tuesday] will be the 11th meeting over five weeks where the committee has discussed this topic. We heard 13 hours of comprehensive testimony from 10 different witnesses. Canadians can judge for themselves the facts, perspectives and relevant legal principles." The pre-scheduled meeting also came a day after Clerk of Privy Council Michael Wernick, a key player in the SNC-Lavalin affair, announced he would be stepping down after 38 years of public service. While he called the move 'retirement', he acknowledged there is "no path" for him to have a "relationship of mutual trust and respect" with opposition party leaders following what critics described as his partisan statements before the committee on the SNC-Lavalin affair. He has denied making "veiled threats" to pressure Wilson-Raybould.